The Mausoleum of Avicenna is a complex located at Avicenna Square, Hamadan, Iran. Dedicated to the Iranian polymath Avicenna, the complex includes a library, a small museum, and a spindle-shaped tower inspired by the Ziyarid-era Kavus Tower. Designed by Hooshang Seyhoun, it was built in 1952, replacing an older building dedicated to Avicenna which was destroyed in 1950. The Pahlavi government had plans to build the mausoleum since at least 1939. The mausoleum was eventually dedicated in a grand ceremony in May 1954, and the avenue running in front of it was also renamed in honor of Avicenna. As the monument was a central element of the propagation of Iranian nationalism by the Pahlavi government, it was consequently in danger of being defaced, but as Khomeini himself was an admirer of Avicenna, the square was not renamed after the 1979 Revolution. ↑ Thresholds 24, Massachusetts Institute of Technology, Department of Architecture, 2002, p. 49. ↑ Jay M. Rasooli, Cady Hews Allen, The Life Story of Dr. Sa'eed of Iran, William Carey Library, 1983, 161f. ↑ Thresholds 24, Massachusetts Institute of Technology, Department of Architecture, 2002, p. 48. "At the core of the Pahlavi 'pride,' around which the imagined Iranian nation was exulted before the Revolution, the tomb complex came under the risk of state vandalism between 1978 and 1980." Pope, Arthur Upham. Persian Architecture. Tandem Verlag GmbH., 2007. 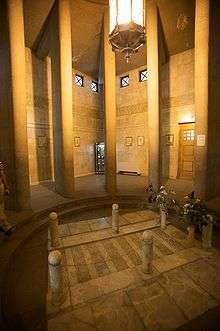 Wikimedia Commons has media related to Avicenna Mausoleum. This article is issued from Wikipedia - version of the 12/22/2015. The text is available under the Creative Commons Attribution/Share Alike but additional terms may apply for the media files.